SWEET COUNTRY follows what happens when a new man arrives in remote Australia. Looking for someone to help him with some projects he asks preacher Sam Neil for aid. Neil sends Sam Kelly and his wife, Lizzie, to help him. When the man rapes Lizzie,Kelly kills him and the couple flee into to the wilderness because being Aborigine they will not get a fare shake. As expected the law pursues the pair. De facto western has a great deal on it's mind concerning race, politics, humanity and religion. What could have been a very simple story is made larger by dealing with a good many matters straight on. It is a headier tale than one might expect from "westerns" even with the recent release of films like the cousin by blood HOSTILES. This is a film that speaks about how we treat all of humanity. While most definitely a good film it is not going to play well with some audiences. A measured (aka slow) tale that jumbles the time line and doesn't use music, this is not a film for those looking for an easy popcorn movie. This is a film you have be patient with and go along with on it's own course. The cast is first rate from top to bottom and they make us care about everyone's plight regardless of who they are. In the end I was moved, so much so I emailed friends right after finishing it to make sure they had it on their must see list, which is probably the best thing I can say about the film. 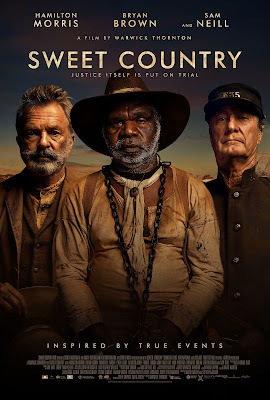 SWEET COUNTRY opens in theaters Friday.